Glassware is incredibly and totally important to the entire beer drinking experience. I recently had the opportunity to take part in a hands on experiment of this and I was absolutely blown away- the shape of a glass has a huge effect on the aroma and taste of a beer. What’s more, every beer has an ideal glass shape (which is just now being discovered in the case of a lot of new age beers, like IPAs). But that’s very advanced; it would be ludicrous for you to stock 10+ types of glasses in your house for every kind of beer you can possibly encounter. Instead, I recommend you make a slight investment in some Snifter glasses (you will probably recognize these as glasses usually used for brandy and cognac) as they work best for capturing the aromas of a wide range of beers and provide room to swirl and agitate aromas. Or, you can even just go for standard red wine glass to replicate the Snifter shape. Just trust me on this one. See image below for an example of a Snifter glass. See image below for proper beer pouring form. 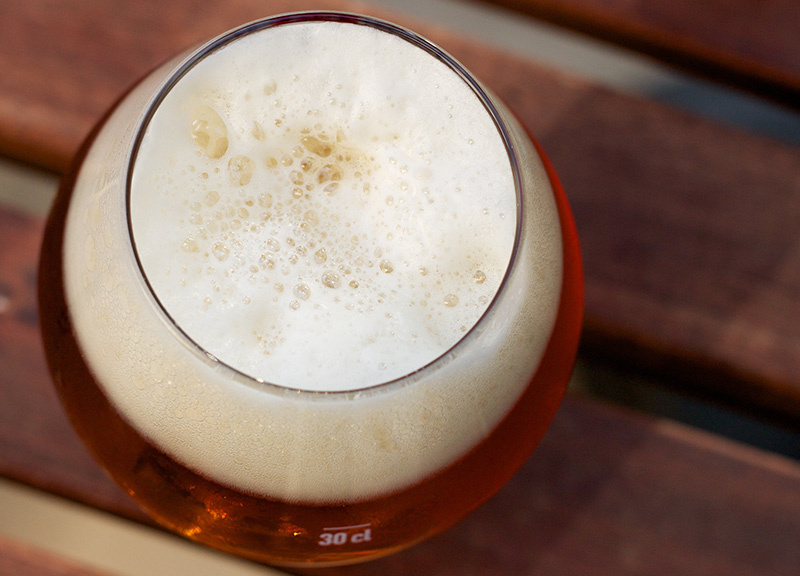 Before going straight to the drinking- first take a look at the beer in your glass. Raise it in front of you, observe its consistency, head (aka foam on top) and color. This will enrich the sensory enjoyment of the whole tasting experience. Yes, this might make you look like a snob, but it’s a must. Gently swirl your beer (this is why you only filled it halfway). Do a few swirls and then bring your nose directly to the glass and smell. 90-95% of what we taste is actually experienced through our nose, so make sure you give yourself a moment to really take in the bouquet of aromas in the beer. And now, finally, taste the beer! Resist the urge to chug and swallow immediately; instead sip and let it wander and explore your entire palate. Make a mental note of the physical sensation produced in the mouth (dubbed mouthfeel by the pros), the consistency of the beer and of course the flavor of the beer. If you’re tasting a few beers one after the other, please for the love of god rinse your glass in between beers. Otherwise the second and third beer you taste will be more of a melange than an actual beer. Also- note to the wise- if you’re planning on enjoying a few different types of beer in one sitting, make sure to start with lighter, less ABV beer to darker, richer, higher ABV beer. As always, please consume in moderation and recruit a designated driver. Cheers!